Five Forces Analysis helps the corporate strategist to analyse and evaluate a competitive environment. Porter (2008) says that strategy is considered ‘too narrowly,’ and the the Five Forces allows strategists to consider more market dynamics. For example, he reasons that digital technologies are a dynamic drivers of the competitive environment, and so Five Forces can be used to evaluate new and innovative digital industries. Five forces analysis looks at five key areas namely the threat of entry, the power of buyers, the power of suppliers, the threat of substitutes, and competitive rivalry. Economies of scale e.g. the benefits associated with bulk purchasing. The high or low cost of entry e.g. how much will it cost for the latest digital technology? Ease of access to distribution channels e.g. Do our competitors have the distribution channels sewn up? Cost advantages not related to the size of the company e.g. personal contacts or knowledge that larger companies do not own or learning curve effects. Government action e.g. will new laws be introduced that will weaken our competitive position? How important is differentiation? e.g. The Champagne brand cannot be copied. This desensitises the influence of the environment. This is high where there a few, large players in a market e.g. the large grocery chains. If there are a large number of undifferentiated, small suppliers e.g. small farming businesses supplying the large grocery chains. The cost of switching between suppliers is low e.g. from one fleet supplier of trucks to another. The power of suppliers tends to be a reversal of the power of buyers. Where the switching costs are high e.g. Switching from one software supplier to another. Power is high where the brand is powerful e.g. Cadillac, Pizza Hut, Microsoft. There is a possibility of the supplier integrating forward e.g. Brewers buying bars. Customers are fragmented (not in clusters) so that they have little bargaining power e.g. Gas/Petrol stations in remote places. Where there is product-for-product substitution e.g. email for fax Where there is substitution of need e.g. better toothpaste reduces the need for dentists. Where there is generic substitution (competing for the currency in your pocket) e.g. Video suppliers compete with travel companies. We could always do without e.g. cigarettes. This is most likely to be high where entry is likely; there is the threat of substitute products, and suppliers and buyers in the market attempt to control. This is why it is always seen in the centre of the diagram. Of Course, Five Forces Analysis is more complex than this brief lesson 🙂 However, take a look at this Harvard Business Review Article which includes an interview with Michael Porter. 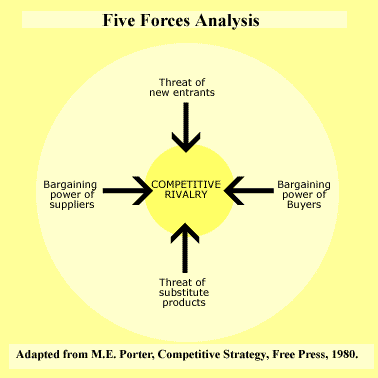 Based upon Competitive Strategy: Techniques for analyzing industries and competitors, Porter M.E., (1980), Free Press, and The Five Competitive Forces that Shape Strategy, Harvard Business Review, January 2008.